Imagine yourself sitting on a sun drenched deck of an uber modern five star resort overlooking the cool waters of the Caribbean. You are sipping a crisp glass of white wine, maybe Pinot Grigio and the server has set down a plate of the freshest and most colorful fruit you have seen in a long while. 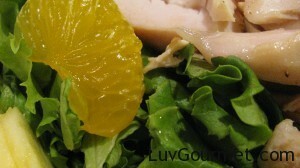 Topping the fruit are tender slices of chicken breasts and the server is drizzling a creamy orange dressing over all. Wake up! Sounds good doesn’t it? It “is” extremely good and it doesn’t disappoint. 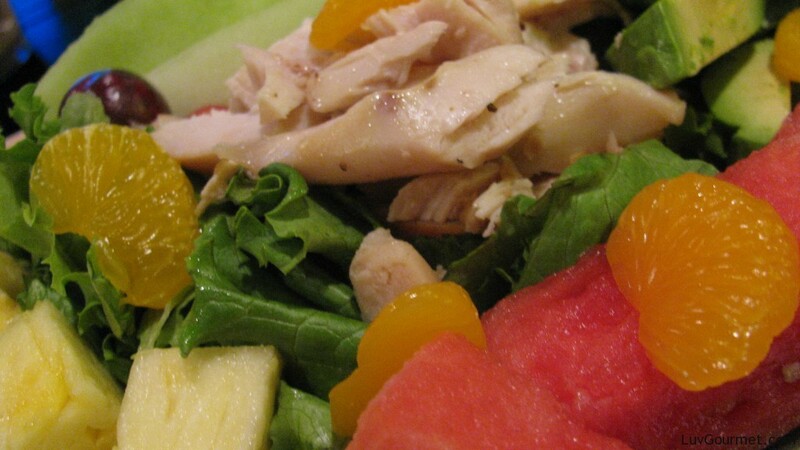 I know it is just a salad; but trust me it is lite, refreshing and delicious. 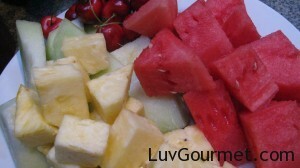 It is perfect for a summer afternoon or dinner entree; when face it, you would rather be at that resort! Combine orange juice, vinegar, dry mustard, sugar, sesame oil, and salt in a blender until thick. Blend until sugar is dissolved. With blender running on low, slowly drizzle in oil, mixing until just combined. Layer the torn lettuce with chicken or shrimp, mandarin oranges, red bell pepper, green onions, all fruit and dried cherries or cranberries.